Editor&apos;s Note: As we continue to add expert voices to our Hendricks County Insider team, let me be the first to introduce you to Erika Brown, a professional photographer who lives in Hendricks County and owns Erika Brown Photography. We plan to tap into Erika&apos;s wedding expertise to serve as our monthly wedding blogger. All of the photographs you will see with her stories were taken by her. In July 2015, my husband and I packed a moving truck in Atlanta, Ga., and plugged Danville, Ind., into our GPS. After discovering that his true calling is real estate, my husband, Austin, and I decided that with the fantastic family support we have in Danville, it only made sense to return to Indiana. As a wedding photographer, I had built a thriving business in Atlanta, and I was apprehensive about what a cross country move would do for my business. However, Indiana welcomed Erika Brown Photography with a full calendar of fantastic weddings in 2016. We were blown away to be named one of Indianapolis’ Best Wedding Photographers in 2016, so honored to have our weddings published on blogs throughout the internet and thrilled to have one of our weddings that we shot just before leaving Georgia appear in the Knot’s 50 Weddings, 50 States print feature. However, what we are most proud of is the excellent experience we are able to provide our clients and the glowing reviews we receive. Throughout the 2016 wedding season, we had the opportunity to photograph a handful of weddings in Hendricks County, and I’d love to introduce you to those beautiful wedding venues. 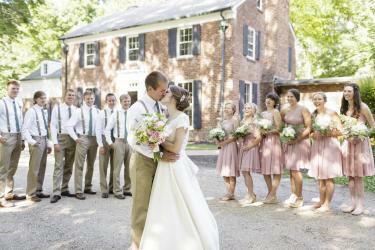 What a fantastically beautiful wedding barn venue (pictured above)! This barn was built in Lizton, near I-74, especially for the purpose of hosting weddings and events. So many details were thought through to give couple’s options for hosting the wedding of their dreams. I highly recommend this venue to anyone seeking an outdoor wedding or barn wedding. White Lick Presbyterian Church is an adorable, historic country church. They have an outdoor location for a wedding ceremony or the historic sanctuary of the church. The wedding we photographed was held at White Lick Presbyterian Church with a reception that followed at Nehemiah Ranch. Nehemiah Ranch is a secluded, rustic barn venue where you can have a true, country setting for your wedding and/or reception. I have a soft spot for the Blanton House because I was married there, once upon a time. It’s a fantastic, historic house on North Washington Street in Danville. It’s owned by the parks department and offers so much versatility for a variety of wedding plans. Most weddings are held in the back lawn, but there is a tented courtyard as well as the historic house for your use on your wedding day. 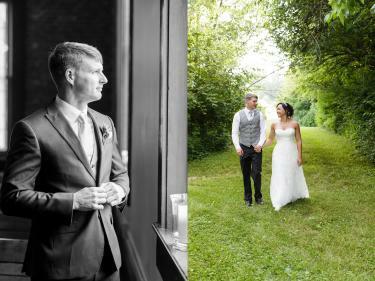 There are so many more incredible wedding venues in Hendricks County, but these are just the few we were honored to photograph since returning to Indiana. I’ll be returning regularly on the Hendricks County Insider for insights and tidbits on all things wedding in Hendricks County. In fact, I’d love to write about topics that are interesting and relevant to you. So, if you have a wedding topic that interests you, or a suggestion for a future post, I’d love for you to leave a comment below.